Ginger contains Zingiberene, Curcumene, Sesquiphellandrene, and bisabolene are efficacious to prevent anti-vomiting and anti-inflammatory. •Helps relieve symptoms - flu-like symptoms, such as mild fever, sneeze - sneeze. 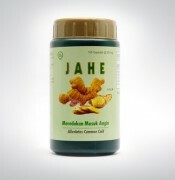 Helps relieve symptoms - flu-like symptoms, such as mild fever, sneeze - sneeze.